“Look at this,” he replied. “Just look at it!” He stepped back, and I put my eye to his device. I have never understood how looking through two pieces of curved glass can bring close distant sights; doesn’t the same amount of light hit the first lens as would hit a plain circle of glass? And if so, what then could possibly be done to that amount of light within two lenses, to make it reveal so much more? Mystified, I looked down at the lush greenery of Tunisia. There in the shimmery circle of glass was a jumble of wood and thatch in a rice paddy, pale browns on light green. “Amazing,” I said. I directed the telescope to the north. On certain days, as Desmond once explained to me, when the temperature gradients layer the atmosphere in the right way, light is curved through the air (and tell me how that works!) so that one can see farther over the horizon than usual. This was one of those strange days, and in the lens wavered a black dot, resting on top of a silver pin that stuck up over the horizon. The black dot was Rome, the silver pin was the top of the graceful spire that holds the Eternal City aloft. My heart leaped to know that I gazed from Carthage to Rome. I did as he directed, even leaning a tiny bit over the railing to do so. Our new Carthage has a spire of its own, one every bit the equal of Rome’s, or that of any other of the great cities of the world. The spire seemed to the naked eye a silver rope, a thread, a strand of gossamer. But through the telescope I saw the massy base of the spire, a concrete block like an immense blind fortress. I saw, there in the curved glass surface; it was just as he had said. “At that pace it will take them ten thousand years,” Desmond said bitterly. “Now there’s something to fear,” he said nastily. With a grimace he put the telescope in the big duffel bag, picked it up and followed me in. We walked down the hall to see how my entry had been placed. Like Desmond, before he quit sculpting, I was chiefly interested in finding and isolating moments of dance that revealed, by themselves, all the grace of the whole act. This year I had stopped a pair of ballet dancers at the end of a pas de deux, the ballerina just off the base of the display as her partner firmly but delicately returned her to the boards. How long I had worked with the breeders, to get ectogenes with these lean dancers’ bodies! How many hours I had spent, programming their unconscious education, and training and choreographing them in their brief waking hours! And then at the end, how very often I had had them dance on the tableau base, and stopped them in the force field, before I caught them in the exact moment that I had envisioned! Yes, I had spent a great deal of time in my sculpting chamber, this year; and now my statue stood before us like the epitome of all that is graceful in the human spirit. At a proper angle to the viewers, too, I was pleased to see, and under tolerable lighting. On the two faces were expressions that said that for these two, nothing existed but dance; and in this case it was almost literally true. Yes, it was satisfactory. Wordlessly Desmond followed her, his face so blank of expression that all his thoughts showed clear. A whole crew followed us discreetly, for Desmond and Cleo’s antipathy was legendary. How it had started none remembered, although some said they had once been lovers. If so, it was before I knew them. Others said Desmond hated Cleo for her success in the sculpture competitions, and some of the more sharp-tongued gossips said that this envy explained Desmond’s new, morbid interest in the world below—sour grapes, you know. But Desmond had always been interested in things no one else cared about—rediscovering little scientific truths and the like—and to me it was clear that his fascination was simply the result of his temperament, and of what his telescope had newly revealed to him. No, his and Cleo’s was a more fundamental hatred, a clash of contrary natures. Now Desmond stared at Cleo’s new statue. It is undeniable that Cleo is a superb artist, especially in facial expressions, those utterly complex projections of unique emotional states; and this work displayed her usual brilliance in that most difficult medium. It was a solo piece: A red-haired young woman looked back over one shoulder with an expression of intense vulnerability and confusion, pierced by a sharp melancholy. It was exquisite. Now, this was a question one simply didn’t ask. Each artist’s arcology was his or her own sovereign ground, a physical projection of the artist’s creative unconscious, an entirely private cosmos. What one did to one’s material there was one’s own business. But the truth was no one had forgotten the unfortunate Arthur Magister, who had exhibited increasingly peculiar and morbid statues over a period of years, ending with one of a maiden who had had on her face such an expression that no one could bear to look at it. Though the rule of privacy was maintained, there were of course questions muttered; but no one would ever have found out the answers, if Arthur had not blown up himself and his arcology, revealing in the wreckage, among other things, a number of unpleasantly dismembered ectogenes. So it was a sensitive issue; and when Desmond asked Cleo his brazen question, with its dark implication, she blanched, then reddened with anger. Disdainfully (though I sensed she was afraid, too) she refused to reply. Desmond stared fiercely at us all; were he an ectogene, I would have stopped him at just that instant. “Little gods,” he snarled, and left the room. That would cost him, in reputation if not in actual sanctions. But the rest of us forgot his distemper, relieved that we could now begin the exhibit’s opening reception in earnest. Down at the drink tables champagne corks were already bringing down a fresh shower of jacaranda blooms. It was just a few hours later, when the reception was a riotous party, that I heard the news, passed from group to group instantly, that someone had broken the locks on the tableaux (this was supposed to be impossible) and turned their force fields off, letting most of the statues free. And it was while we rushed to the far end of the greenhouse-gallery, around the great curve of the perimeter of the penthouse, that I heard that Desmond Kean had been seen, leaving the gallery with Cleo’s red-headed ectogene. Utter scandal. This would cost Desmond more than money; they would exile him to some tedious sector of the city, to scrub walls with robots or teach children or the like: They would make him pay in time. And Cleo! I groaned; he would never live to see the end of her wrath. Well, a friend can only do so much, but while the rest were rounding up and pacifying the disoriented ectogenes (which included, alas, my two dancers, who were huddled in each other’s arms) I went in search of Desmond, to warn him that he had been seen. I knew his haunts well, having shared most of them, and I hurried to them through the uncrowded, vaguely Parisian boulevards of the penthouse’s northern quarter. Silence. What to do in such a situation? I had no precedent. After a good thirty seconds had passed I opened the door again. No Desmond, no girl. I, however, was one of those who with Desmond had first discovered the other exit from the planetaria, and I hurried to the central ball of optical fibers, which even he could not fix, and pulled up the trap door beside it. Down the stairs and along the passageway, into one of the penthouse’s other infrastructures I ran. I will not detail my long search, nor my desperate and ludicrous attempts to evade rival search parties. Despite my knowledge of Desmond’s ways and my anxious thoroughness, I did not find him until I thought of the place that should have occurred to me first. I returned to the northeast corner of the viewing terrace, right there outside the glass wall of the greenhouse-gallery, where (as it was now dusk) if the artists inside could have seen through their own reflections, they would have looked right at him. He and the redhead were standing next to Desmond’s telescope, their elbows on the railing as they looked over the edge side by side. Desmond had his duffel bag at his feet. Something in their stance kept me from emerging from the shadows. They looked as though they had just finished the most casual and intimate of conversations—a talk about trivial, inessential things, the kind of talk lovers have together after years of companionship. Such calmness, such resignation . . . I could only look, at what seemed to me then an unbreakable, eternal tableau. “Gold,” said Desmond. He fingered the curl . . . But his words didn’t appear to touch the woman. She turned away, and lifted an empty glass left on the railing. On her face was an expression so . . . lost—a sudden echo of her expression as statue—that I shivered in the cold wind. She didn’t have the slightest idea what was going on. A long moment: I shudder to think of the tableau we three made. The world is a cruel sculptor. “But—but where should I go?” I stammered. “You know this city as well as I! Try the gallery’s service elevator, and get on the underfloor—you know,” he insisted, and yet he was about to give me further directions when the far greenhouse door burst open and a whole mob poured out. We were forced to run for it; I took the woman by the hand and sprinted for the closer greenhouse door. The last I saw of Desmond Kean, he was climbing over the railing. My God, I thought, he’s going to kill himself—but then I saw the purposefully rectangular package strapped to his back. © 1986 by Kim Stanley Robinson. 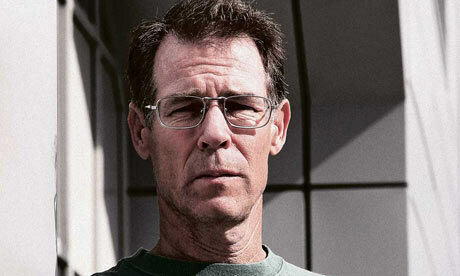 Kim Stanley Robinson is the bestselling author of sixteen novels, including three series: the Mars trilogy, the Three Californias trilogy, and the Science in the Capitol trilogy. He is also the author of about seventy short stories, some of which have been collected in the retrospective volume The Best of Kim Stanley Robinson. He is the winner of two Hugos, three Nebulas, six Locus Awards, the World Fantasy Award, the British Science Fiction Award, and the John W. Campbell Memorial Award. His latest novels are Galileo’s Dream, 2312, Shaman, and the forthcoming Red Moon.